In the late 1970s, the top rate of income tax in the UK was over 80 per cent and the top one per cent of income tax payers paid just 11 per cent of the total. Rates are dramatically lower today, and the one per cent paid 27.7 per cent of the 2011/12 total. The idea you get more money out of the rich by putting the screws on runs counter to the facts. The figures in the US are similar: In 1980 the top marginal rate (for married taxpayers filing jointly) was 70%, and the top 1% of earners paid 19% of total income tax revenues (the bottom 50% paid 7%). In 2012 (with a top marginal rate of 35%) the top 1% paid 38% of all taxes, and the bottom 50% only 3%. Clearly, as Sidwell says, “the idea you get more money out of the rich by putting the screws on runs counter to the facts.” Not that facts matter to those bent on income redistribution. This isn’t precisely a vindication of the Laffer Curve, but it’s evidence of its conceptual correctness. Another (and, I think, better) way of looking at this is to examine the total federal tax “take” as a percentage of GDP, and compare it to the top marginal tax rates. In the US, between 1950 and the present, the top marginal rate varied from a peak of 92% (in 1952 and 1953) to a low of 28% (1988-90); it sits at 40% today. And of course over that period there were all sorts of other structural changes to the overall tax system: myriad credits, caps, deductions, etc., came and went. Yet through it all the percentage of GDP taken in taxes averaged just around 18%, and never varied much from the mean (the standard deviation is only 1.22). Clearly, whatever changes the government throws at us, the American people manage to structure their affairs such that the government gets only 18%. So it seems to me that’s what its spending limit ought to be. Put a hard cap on government spending (not a “balanced budget amendment”, but rather a fixed spending cap expressed as a percentage of GDP) and the politicians would have every incentive to construct a tax system designed to maximize economic growth, because it would simultaneously maximize their spending ability. So of course that will never happen. Not a bad idea, but make that the most recent past GDP that can be precisely determined, not some ‘anticipated’ GDP that bears no relationship to reality but strangely always errs in an upward direction. Agreed, PFP. I would use “trailing” GDP. The trouble, with the post and the comments, is that they are based upon REASON. Elections are not about reason – they are about emotion. The culture (thanks to many decades of effort by the forces of “Social Justice”) is based on envy and hatred of “the rich” and “big business”. As Barack Obama has often said – he wants higher income tax rates and higher Capital Gains tax rates even if this means LESS government revenue. Many people in Britain are the same – they see higher tax rates as a good thing in themselves. It is much like traditional Latin American culture. The people are taught (by everyone – from the schools, to the churches, the media….) that everything bad in their lives is because of the evil “the rich” and the evil “big business”. Higher tax rates and ever more regulations are supported for RITUAL reasons (to do with this culture). Reason has nothing to do with this – and arguments (as they are based upon reason) will have little effect. I already knew what Laird writes in his 2nd paragraph, from Dan Mitchell’s blog. But Laird should be wary of drawing the conclusion that politicians should have an incentive “to construct a tax system designed to maximize economic growth”: Perry abhors this principle as “fascist”. * not an axiom, just a heuristic. Perry abhors this principle as “fascist”. No I abhor neo-feudal fascists who want the state to be the wise God directing land occupancy towards ‘better’ uses than mere free markets might lead to… those are the “fascists”. In America, the top 1% of income earners pay about 36%-37% of the total income tax revenue…and they’re hated for it by the vulgar (commonplace) people. They are told that they don’t pay their “fair share”. Well, that’s true, they pay more than their fair share. That one will receive less revenue when taxes are draconian, (the Laffer Curve), is only understood by people smarter than turnips. Snorri, the principle isn’t “fascist”, but it is utilitarian. Which certainly is not a compliment; it’s analogous to “populist” (which I consider to be synonymous with “devoid of principle”). But a utilitarian argument can be useful in advancing a position which is also otherwise admirable, as I believe this one is. You play the cards you’re dealt. Facts never get in the way of degressives. On the other side our libtard snobs never complain when certain people rig the markets. 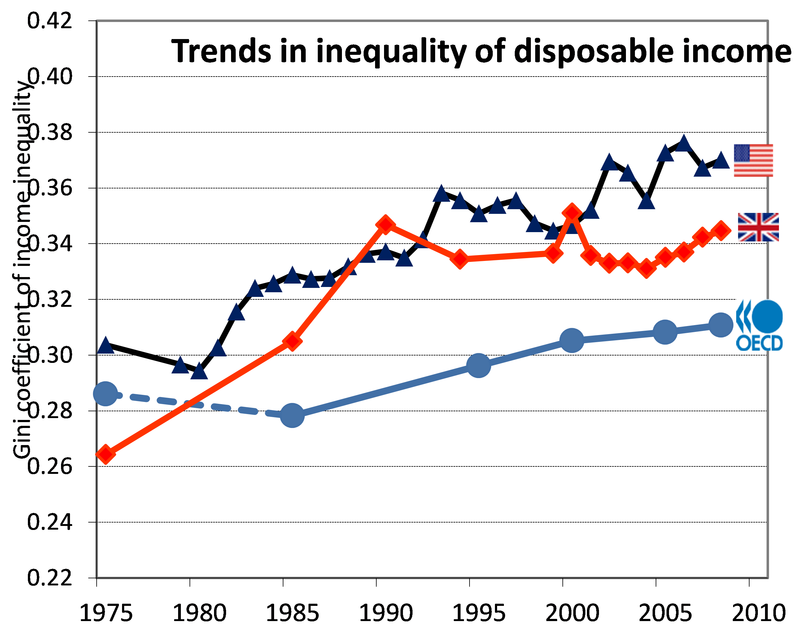 Look at the Gini Index from the 70s to now and you may get an inkling as to why the 1% are paying more of the total income tax. You may also wish to consider changes in indirect taxation. The causal relationship is the top 1% make more and so pay more in total when less appropriative taxation pevails. However making the rich richer does not make the poor poorer. But making the rich poorer usually makes everyone poorer. That’s why worrying about “inequality” once you get past subsistence is a mug’s game. Yes indeed. “Equality” (of outcome) as well as “giving back to the community” as a means of retributive justice and “redistribution” (of wealth) only applies to tribes of hunter-gatherers in a world of zero sum finite “scarce” resources. For the most part, such worlds ceased to exist during the neolithic period 10,000 yrs ago. Today, such nonsensical concepts have no bearing, no relevance nor application in any other context, but it seems to strike some primitive chord in the dark emotive recesses of most people’s psyche, and as such, such ideas seem to be powerful tools in the dark wizardry of propaganda. And the dark wizardry of propaganda is how magicians (witch-doctors) control our modern world by shaping zeitgeist. Because “everyone knows” that man made climate change threatens all life on earth; “everyone knows” that TEA partiers are “racists”, “everyone knows” that government control is beneficient; “everyone knows” that we need paternalistic church and state “for the sake of the children”; and “everyone knows” that Democrats freed the slaves in America’s deep south and “everyone knows” that laws stop criminals…right?